There is something so nice about white fish and a fruit salsa. 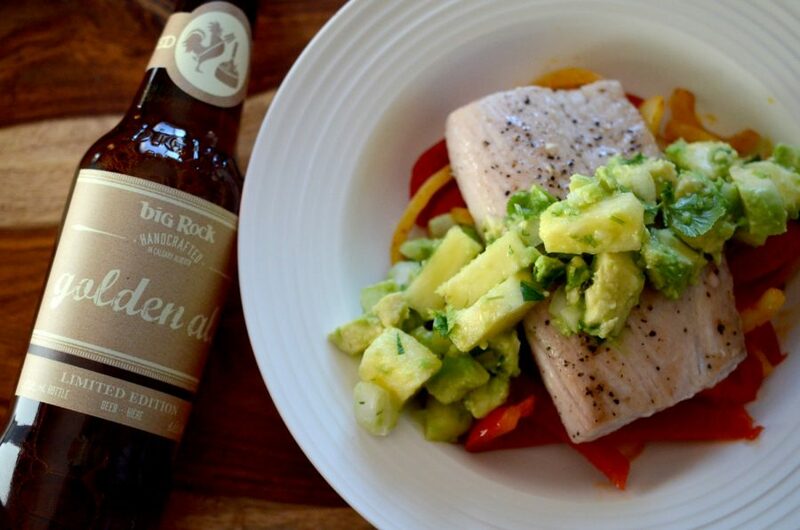 The sweetness of the fruit perfectly complements the fish, as does the Big Rock Golden Ale’s caramel sweetness. It is balanced by the light hop and the tropical pineapple plays off the tropical fruit notes of the beer. *White onion will work too, it will just be a bolder taste. In a saucepan over medium heat, sauté the peppers, sliced onion, 1 tbs of canola oil and smoked paprika. Sauté until peppers are soft and onions are translucent. Set aside. Combine the pineapple, red onion, cilantro and avocado together in a bowl. Add the lime juice and toss to ensure that everything is coated with the lime juice to prevent the avocado from browning. Set aside. Heat the butter in a large skillet over medium high heat. While the pan is heating, season both sides of the fish with salt and pepper. Place the fish in the pan and cook for about 2-3 minutes a side (depending on the thickness of the fish), until the fish begins to flake and the exterior starts to brown or internal temperature reaches 130F. Remove from heat. To assemble, place the peppers and onions at the base of the plate and top with the piece of fish. To finish, gently place a liberal spoonful or two of salsa on top.